The P-40 Kittyhawk was the last in a long line of ‘Hawk’ ‘Pursuit’ aircraft built by the Curtiss Aircraft Corporation, a Company which can trace its heritage to Glenn Curtiss, who along with the Wright Brothers was one of the American Pioneers of Aviation. The Kittyhawk, which lacked the high altitude performance of contemporary European aircraft, did not find favour as a fighter in that theatre. It was, however, noted for its low level performance, rugged construction and armament of six 50 calibre Browning machine guns, which made it a valuable ground support aircraft. Accordingly it was successfully operated in this role in all theatres of World War II with notable exploits in the North African, Pacific, Italian and Russian Campaigns. The Kittyhawk, or P-40 in USAAF service was the mainstay of the American Volunteer Group (AVG) a counter insurgency group led by General Claire Chennault in the Indian Chinese theatre. This group conducted clandestine operations from the Chinese mainland behind the Japanese occupation zones, thereby engaging a large Japanese force which could not be deployed elsewhere. This clandestine force conducted hit and run raids within mainland China, to Hong Kong and Burma. Curtiss P-40 Kittyhawk ZK-CAG (civilian registration) A29-448 (Royal Australian Air Force designation) or GA-C (No 75 Squadron RAAF designation), works serial number 42-104730 was constructed by the Curtiss Aircraft Corporation t the Buffalo Plant New York in May 1943 on order to the US Army Air Corp. It was delivered to the Royal Australian Air Force under a lend-lease agreement and put ‘on charge’ as no A29-448 on 8 August. The aircraft was allocated to No 75 Squadron RAAF on 25th August Turnbull Field, Milne Bay, New Guinea. The aircraft has an Operational Wartime History with no’s 75 and 78 Squadron Royal Australian Airforce from this time. After a short service life, the aircraft was scrapped following a landing accident after a total electrical failure at Tadji airfield (New Guinea) in May 1944 The aircraft was recovered by an expedition led by Charles Darby in the mid 1970’s and subsequently rebuilt at Auckland and the aircraft is faithfully presented as the aircraft that flew in New Guinea in RAAF service. 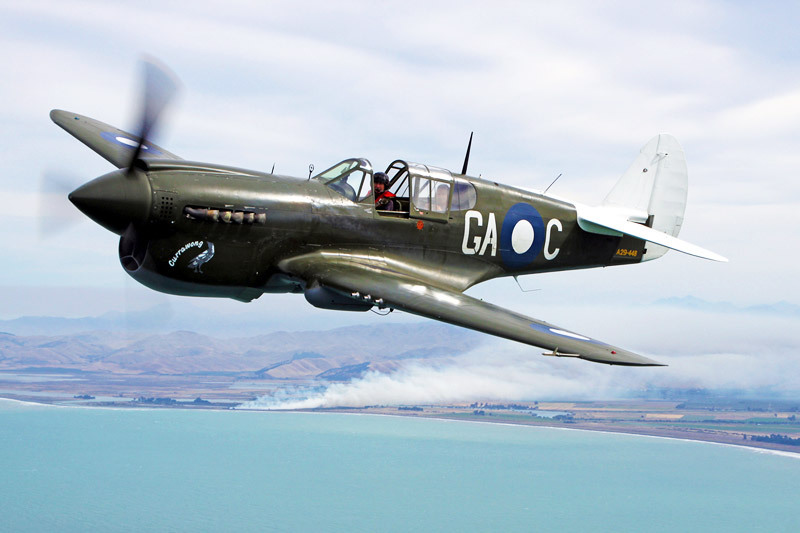 Its first public appearance was at Warbirds over Wanaka in 2000. From the 13000 plus P-40’s built during World War II, Currawong is one of about twelve in an airworthy state Worldwide. Warbird Adventure Rides offer the opportunity to fly in this historic fighting aircraft of World War II.